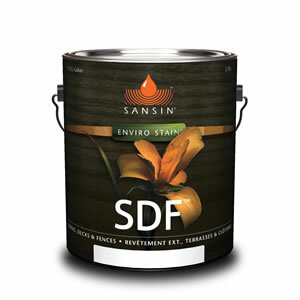 Sansin SDF Topcoat is a durable top-coat system that can be applied to any SDF base coat system – for substrates including siding, logs, and timbers. The high solids will build a satin like finish that is highly durable to moisture and weathering. SDF Topcoat is highly resistant to wear, doesn’t discolor over time, and enhances the natural UV protection – and beauty – of your existing Sansin SDF finish. Because of its high solids content, SDF Topcoat enhances the look of your base coat with beautiful saturated color and a full, rich finish. Consult a dealer or a Sansin customer service professional for details. View the SDF Topcoat Product Data Sheet (PDF) for information about application, preparation, maintenance, and more. View the SDF Top Coat Safety Data Sheet (PDF).